MINI Cooper Acccessories + MINI Cooper Parts :: OutMotoring.com MINI Blog :: MINI Accessories :: Save your MINI from certain death. Save your MINI from certain death. 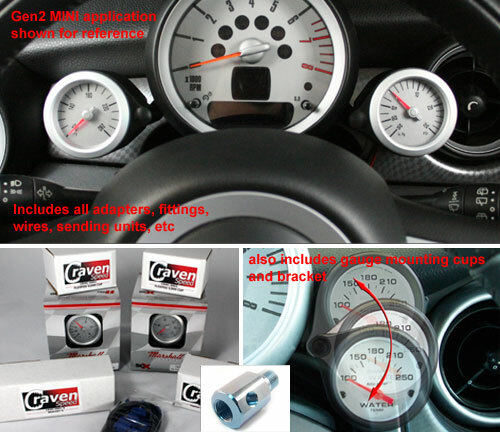 Synopsis: Add some gauges so you can keep in tune with your MINI. There's no question MINI was after a certain bare bones aesthetic when the interior was designed and engineered. It looks unique, it has tons of design character and it draws people into the MINI brand. As a result of the spartan simplicity there is a lack of gauges that communicate what is going on with critical engine status. Adding a few gauges to your MINI such as a oil pressure, oil temp, water temp or boost will allow you know how what your MINI engine is doing. How hard is it working? How hot is it? Is it having a bad day? We're not saying these will allow you talk to your MINI and get to know it's inner feelings but a simple "hey I'm overheating" or "wow, you are pushing me to the LIMIT- please cool it" would be nice. Doing at LEAST a oil temp, or water temp is a great start. Adding Oil Pressure or boost will be a close second followed by Boost but any combination will be better than what's there; nothing. This kit will allow you to build a setup that suits your needs and we can even add 2 more gauges to this kit for you - just drop us a line if you want to make 4 total - or even just 3. Comments on Save your MINI from certain death.